Do PLSQL Procedures And Anonymous Blocks Have A SQL_ID? I read in a forum that Oracle PLSQL will not have a SQL_ID. That seemed strange to me because I swear I’e seen PLSQL running on the database server and seen it in a library cache dump tracefile. And to be found in the library cache, the object must have a hash value. Hmmm... But perhaps not a SQL_ID. 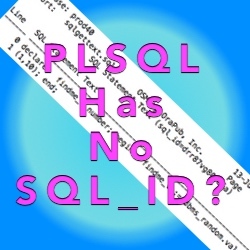 If I'm wrong, then a blank SQL_ID could be the result of PLSQL code. Looks like it's time to run an experiment! Actually, I needed two experiments. The first experiment focuses on a PLSQL procedure. The second experiment focus on an anonymous PLSQL block. The result was a very cool experiment; clean, straightforward and it demonstrated exactly what I wanted to confirm. 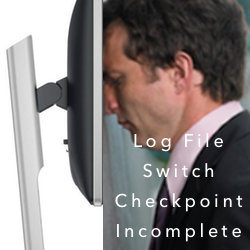 If you have read my recent postings HERE and HERE you'll recall that when there is a log file sync wait event, the SQL_ID can be blank, empty or null. But when I was doing some research on why an Oracle SQL_ID can be empty, a forum posted mentioned (with lots of authority), that a SQL_ID is blank when running PLSQL in an Oracle Database. That seemed really strange to me. The only way to disproved this, was to run an experiment. Here's my thinking: If I can demonstrate that both an anonymous PLSQL block and a PLSQL procedure have hash values and SQL_ID's, then I'll feel pretty certain that when I see a blank SQL_ID, it's not because PLSQL is being run. At least not an anonymous block or a procedure. The two experiments are very straightforward. Anyone could easily copy and paste what I typed below. Give it a try! Here are the results for the Oracle PLSQL procedure, followed my an explanation of what happened. Looking at the above code, you can see I first recycled the Oracle instance, just to ensure their is nothing cached in the library cache that will influence the results. Then I created the "findme_prc" procedure and again recycled the instance to ensure there is nothing cached in the library cache to influence the results. I executed the procedure, retrieved my session's previous SQL_ID and retrieved the related SQL text using my OSM tool, sqlgettext.sql. As you can clearly see, my procedure has both an associated SQL_ID and hash_value. I'd say that's a pretty good indication that an Oracle Database PLSQL procedure can have an associated SQL_ID. While the procedure sys.findme_prc has a hash value (so it can be found in the library cache) it does not have a SQL_ID. When run in SQL*Plus, the procedure is wrapped inside a simple "BEGIN" and "END". This is the SQL_ID we see during the procedure execution. You can see in the spool above, SQL*Plus added the "BEGIN" and the "END;"... I did not type that. So while the procedure does not by itself have a SQL_ID, it is truly associated with a SQL_ID. This is important, because my real goal is to understand when a SQL_ID can be blank, empty or null. And in my test case, when the procedure is run the SQL*Plus session does in fact have an associated SQL_ID. Perhaps there is a way to execute the procedure when the calling routine does not have a SQL_ID? Or perhaps Oracle will always wrap the procedure in something with a SQL_ID? But... that's a topic for another post, eh? Perhaps the forum was not referring to a PLSQL procedure. Read on! Perhaps the forum was not referring to an Oracle Database PLSQL procedure, but simply an anonymous PLSQL block. OK, let's modify the experiment slightly to use an anonymous block instead of a procedure and see what happens. Below are the results for the Oracle PLSQL anonymous block, followed my an explanation of what happened. Looking at the above code, you can see I first recycled the Oracle instance... just to ensure their is nothing cached in the library cache that will influence the results. I executed the anonymous PLSQL block, retrieved my session's previous SQL_ID and finally retrieved the related SQL text using my OSM tool, sqlgettext.sql. As you can clearly see, my anonymous PLSQL block has both an associated SQL_ID and hash_value. I'd say that's a pretty good indication that an Oracle Database anonymous PLSQL block can have an associated SQL_ID. Don't believe everything you read... especially if there is no test case. An Oracle Database PLSQL procedure can have an associated SQL_ID. An Oracle Database anonymous PLSQL block can have an associated SQL_ID. 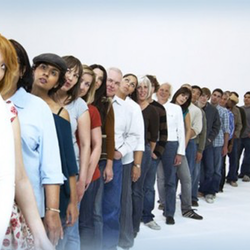 During a log file sync wait event, if the associated SQL_ID is blank, empty or null do not expect the associated SQL to be a procedure or anonymous PLSQL block. It's important to understand that I did NOT prove a procedure or an anonymous block will NEVER have an empty SQL_ID.